Most of us have seen the insensitive pro-choice signs that people hold at marches and rallies. They say things like “abortion on demand and without apology” or “hoes before embryos.” These are the same people who call embryos cysts and fetuses blobs. I know because I used to be one of them. I used to talk about abortion as if it was an operation to remove a tumor. I thought it was ridiculous to be pro-life and I was convinced that only religious fanatics were against legalized abortion. Personally, I always thought having an abortion would be painful and scary, but when it came to the subject of abortion in general, I was okay with it. I didn’t consider unborn babies as real babies, and I thought it was a reasonable option for women who are dealing with trauma, or who just aren’t ready to have kids. That was, until a few months ago. I was several weeks late and almost certain that I was pregnant. I looked up what stage of pregnancy I would be at, trying to estimate how far along I would be, but what I found made me cry. 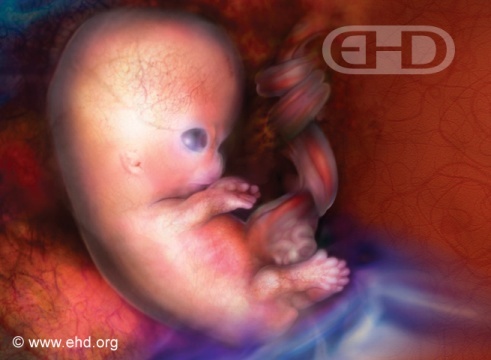 I learned that at just eight weeks the embryo already has hands, and at seven, a brain. I saw how quickly embryos develop and realized... the pro-lifers were right. As a teen, I saw the pro-life billboards that say the heart starts beating at five weeks, and I thought it was just another lie. Now, I wonder why this plain and simple message doesn’t get through to people and why it didn’t get through to me. What I observed is that the subject is usually handled wrong because it’s rarely ever spoken about from a scientific standpoint. People don’t need to listen to philosophical or religious debates, because it doesn’t matter when anyone believes a life begins. It’s true that the vast majority of abortions occur in the first trimester—but even before eight weeks, the child has a heartbeat, a brain, and fingers and toes. In 2008, roughly 29% of all abortions in the U.S. took place between 8 and 13 weeks. If more people truly understood embryonic and fetal development and how rapidly the child develops senses and human characteristics, there wouldn’t be anything to debate. I want pro-lifers to know that not all pro-abortionists are bad people. Most of them just don’t know a thing about prenatal development. When discussing abortion, try to focus on embryonic and fetal development instead of engaging in philosophical or moral debates. People don’t want to hear when you believe life begins or what you think is wrong because they will laugh in your face. Tell them that embryos have nervous systems; that fetuses can hiccup, kick, and stretch. Tell people the scientific facts of embryonic and fetal development that they’ve been taught to close their eyes to, and challenge them to look it up for themselves. Maybe they’ll change their minds too.